This retrospective study analyses the clinical results of 45 osteotomies with an average follow-up of 9.3 months and a maximum follow-up of 19.2 months. The IKS score in the short-term is 186.2, and the survival rate 88.9% with the revision of the osteotomy as fail criteria. The percentage of satisfaction was 86.7%, with 93.3% good results. Immediate or early weight-bearing is possible and doesn’t result in complications. In 40% of the cases, weight-bearing was immediate, and reached 71.1% of the patients within 4 days. 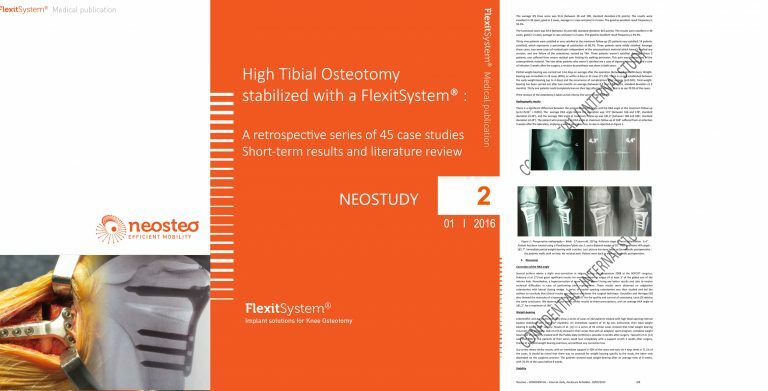 Internal high tibial opening wedge osteotomy with the Neosteo FlexitSystem® plate and locking screws allows a stable and efficient correction, with no significant complications due to the material, with a low discomfort rate.